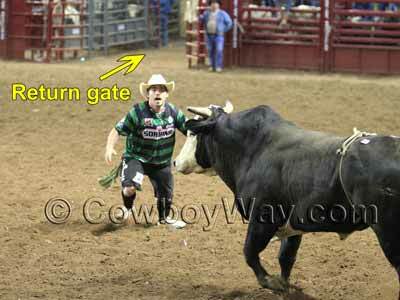 The "return gate" in a rodeo arena is a gate near the bucking chutes that the broncs and bulls use to exit the arena when they have finished bucking. 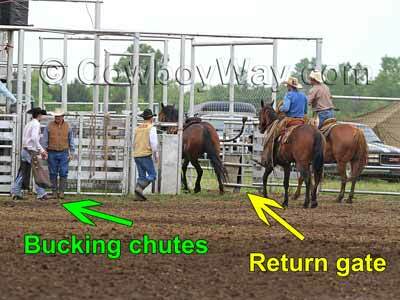 The return gate can be located on either side of the bucking chutes, or in the center. Below: A bronc (the bay horse without a rider) exits the arena through the rodeo return gate. The broncs and bulls (aka "roughstock") always use the return gate to exit the arena  as opposed to other gates the arena may have  because rodeo stock contractors want their roughstock to perform its best. The location of the return gate is very important in helping them perform well. A bronc or bull earns half of the total score for a ride. The rider earns the other half of the total score for the ride. The half earned by the bronc or bull will be higher if they buck well instead of poorly. The half earned by the bronc or bull rider will also be higher if the bronc or bull bucks well instead of poorly. So what does this have to do with the location of the return gate? Roughstock that bucks while covering very little ground usually buck better  and therefore earn higher scores  than those that travel down the arena. If a bronc or bull knows that the return gate is near the bucking chutes it adds to their incentive to leave the chute and buck right where they're at, close to the gate they know they're going to exit through. On the other hand, if the bronc or bull were to be let out of the arena through a gate far away from the bucking chutes they would quickly learn to travel down the arena toward the far-away gate while they bucked, thereby earning lower scores for themselves and their rider. Below: This return gate is located in the center of the arena with bucking chutes on either side. The clown is getting the bull's attention in order to lead him (the bull) to the return gate. Like the broncs and bulls, the calves and steers have a special gate they use to exit the arena. Their gate is located at the "catch pens," and, similar to the return gate for broncs and bulls, the location of the catch pens and the gates leading into them are important to help calves and steers perform their best. You can read about the catch pens here: The Rodeo Catch Pens.